MANY Singaporeans want to work beyond 65 and as many of them should do so if they are able, Prime Minister Lee Hsien Loong said yesterday at the May Day Rally. There should be a practical approach towards hiring of such older workers but it cannot be a "one size fits all" policy, he added. 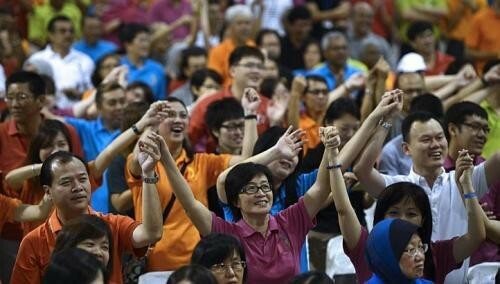 The Government is already encouraging workers to work beyond the retirement age of 62, noted PM Lee. Under the Retirement and Re-employment Act, which came into effect last year, employers must offer re-employment to workers turning 62, at least up to the age of 65. "But 65 is not the end," he said, adding that the Government is encouraging workers to look beyond 65. I think we should see how the Retirement and Re-employment Act works out, give it some time, settle down, and then progressively we will do more." But he cautioned that re-employment depends on workers' health, the nature of their job and companies' needs. Some workers, such as taxi drivers and hospital workers, are already working beyond 70. But not everyone can do that. "We can't go for a 'one size fits all' policy, just pushing up the retirement age or compelling employers to hire all workers regardless of their condition," he said. "We have to take a practical approach, to enable as many as possible to continue working for as long as possible," he concluded. He urged older workers themselves to be flexible about their job responsibilities and status. They also should go for training to master new skills, and stay fit and healthy so they can do their work. Singapore National Employers Federation (SNEF) president Stephen Lee said that while the initial move for re-employment up to age 65 has gone smoothly, further moves will raise more concerns. The tripartite partners have not sat down to discussions yet, but employers might have concerns such as higher health-care costs and a higher occurrence of chronic illness, he said. "So we will have to look at, on a tripartite basis, what are some of the concerns, what are the additional safeguards we need to introduce. "I think increasingly we will look at the state of health of the individual, what sort of work he is capable of doing." Firms could also set aside jobs which are more suitable for older, re-employed workers, he suggested. As for how quickly changes might be made, SNEF's Mr Lee said: "There are some differences between the unions, who want to push it sooner, and the employers who want to look at it and put in the safeguards before we move." But for National Transport Workers' Union general secretary Fang Chin Poh and his fellow unionists, an early move would be welcome. The SBS Transit bus driver estimates that a fifth of his colleagues will soon reach their company's retirement age of 65 - and many want to stay on. "They would be very happy to work past 70 if they can," he said.